This was a surprise for Dozza, to see her dad Papa at DW in an approved costume! Great work Heiko! It was awesome to see you in costume for the first time at Dreamworld! 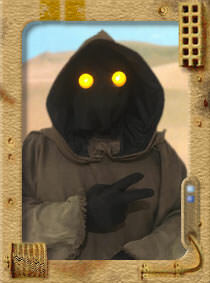 surprise to me as well, i heard someone say is that papa in the jawa and i was like... what? i havent seen an approval for it but wow thats totally awesome, welcome! Congratulations Heiko, welcome to the Redbacks! Congratulations and welcome to the family. there can never be too many Jawa's! Have we ever hit anything with these things?